Alzheimer's Moments: What's Bugging Mom? These little buggers are driving us nuts at night. Mom: What's making all that racket? They're driving me crazy! Ummm, that train has already left the station. 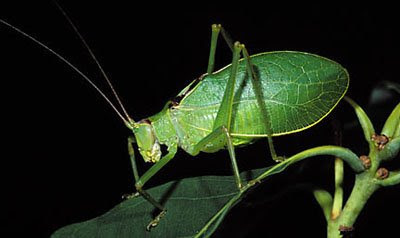 Common True Katydids, relatives of grasshoppers and crickets, are nearly flightless inhabitants of the crowns of deciduous trees. Both male and female katydids make sounds by rubbing their front wings together. They hear each other with ears on their front legs. Breeding season is in late Summer and early Fall. I suppose it's partly my own fault. Over the past few years, I've been systematically killing ground wasps that were burrowing in the front yard. Their food of choice? Katydids. Sounds like Morse code... that would really bug me, too.